Owen Architecture’s Bayside Fire Station in Brisbane has won the 2016 House in a Heritage Context award, sponsored by the Heritage Councils of NSW and Victoria, in the annual Houses Awards. Operating as a fire station until 2004, the 1938 building is a modest, functional civic building that plays a prominent landmark role in the street. The jury citation noted: “Its strong symmetry, solid facade and austerity have been well understood by the architects in this brilliantly understated conversion. Two Victorian projects – Fitzroy Loft by Architects EAT and Acute House by OOF! Architecture – received commendations, and there were 12 projects shortlisted in the category. The 2016 Houses Awards were announced at Sydney’s Doltone House, Hyde Park, on Friday 22 July. 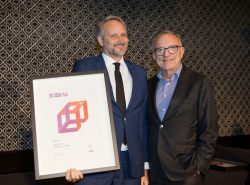 Heritage Council NSW chair Stephen Davies (right) presented the award to architect Paul Owen.